The zygote (top panel, mauve), the blastocyst (second panel, purple). The blastocyst the inner cell mass (light blue) can give rise to the germ cells (eggs and sperm) as well as cells derived from all three germ layers (ectoderm, light blue; mesoderm, light green; and endoderm, light yellow), depicted in the bottom panel. Embryology is the branch of developmental biology that studies the beginning and early growth of sexually reproducing organisms. This life science specialty focuses primarily on embryogenesis (the formation and development of embryos). In humans, the term embryo is traditionally reserved for the first two months of development. After that point, the term “embryo” is replaced by the term “fetus,” which then applies until birth. At the beginning of the individual’s development, the entity is a single cell. After two months, it has limbs, distinct fingers and toes, internal development, and countless cells. So the term “embryo” applies to an individual throughout a vast range of developmental change. Since the time Charles Darwin published The Origin of Species, embryology has been used to support common descent. In fact, Darwin referred to embryological homology as the strongest single class of facts that existed to support his theories. A theory later put forth by Ernst Haeckel, known as the biogenetic law, asserted that the evolutionary history of an organism was recapped during embryo development. Although the biogenetic law is now discredited, in recent years, embryology has reemerged as a tool used by evolutionary biologists that attempt to establish phylogenetic relationships by identifying developmental similarities between taxonomic groups. Evolutionary Developmental Biology is a merging of developmental biology and evolutionary biology that is commonly known as "evo-devo". Embryogenesis begins when a sperm fertilizes an egg and creates a single cell that has the potential to form an entire organism. In the first hours after fertilization, this cell divides into identical cells. Approximately 4 days after fertilization and after several cycles of cell division, these cells begin to specialize, forming a hollow sphere of cells, called a blastocyst. The blastocyst has an outer layer of cells, and inside this hollow sphere, there is a cluster of cells called the inner cell mass. The cells of the inner cell mass will go on to form virtually all of the tissues of the human body. Although the cells of the inner cell mass can form virtually every type of cell found in the human body, they cannot form an organism. Therefore, these cells are referred to as pluripotent, that is, they can give rise to many types of cells but not a whole organism. Pluripotent stem cells undergo further specialization into stem cells that are committed to give rise to cells that have a particular function. Examples include blood stem cells that give rise to red blood cells, white blood cells, and platelets, and skin stem cells that give rise to the various types of skin cells. These more specialized stem cells are called multipotent—capable of giving rise to several kinds of cells, tissues, or structures. Vertebrates, such as humans, have bilateral symmetry and therefore polarity in three dimensions (head-tail, or back-front, and left-right). Establishing polarity is one of the most basic manifestations of emerging specialization. But the egg is roughly spherical, and it is not readily apparent how polarity is established. Although it had been shown long ago that the point of sperm entry determines the plane of first cleavage (and thus subsequent ones) in amphibian eggs, mammals were believed until recently to remain spherically symmetrical until later in development. Recent data on mammalian zygotes, however, suggests that the point of sperm entry may similarly determine the cleavage plane. Even the first two cells resulting from the first cleavage may have different propensities, which persist through the next divisions as the progeny of one cell tend to become the body of the offspring and progeny of the other cell become the embryo’s contribution to the placenta and other supporting structures. The word “fate,” however, might be too strong, because the cells of such very early embryos are resilient to perturbations—if one cell is removed, the remaining ones can compensate. 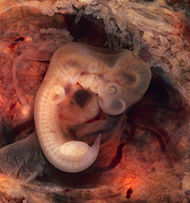 A picture of a human embryo at 5 weeks of development. The basic structures and relations of all the major organ systems of the body emerge during the fourth through the eighth weeks of embryonic development. First, the embryo folds in several ways so that the flat linear structure distinguished by neural tube flanked by somites become roughly C-shaped. The effect of this is to bring the regions of the brain, gut, and other internal organs into their familiar anatomical relations. During the fourth week the neural pores, the ends of the neural tube “zipper,” close. First the one at the cranial or head end, which is called the anterior or rostral pore, closes, and later the caudal or tail-ward pore closes. Closure of the neural pores completes the closure of what will become the central nervous system. Also during the fourth week, limb buds become visible, first buds for arms and later for legs. Further, two accumulations of cells along the neural tube become distinguishable: the alar plate and the basal plate. Cells of the alar plate go on to become mostly sensory neurons, while basal plate cells give rise mostly to motor neurons. Already while the neural tube is closing, its walls along the cranial area are thickening to form early brain structure. Cranial nerves, for example the nerves for the eye and for the muscles of the face and jaw, also are beginning to develop at this time. The embryonic brain develops rapidly in both size and structure especially during the fifth week, and the optic cup that will form the retina of the eye becomes visible as well. Several decades before Darwin published the The Origin of Species, a German embryologist Karl Ernst von Baer had shown that the embryos of some vertebrates looked very similar during particular stages of development. This observation became known as von Baer's law. After reading a summary of von Baer's law in 1842, Darwin concluded that embryonic resemblances were a very strong argument in favor of common descent. In The Origin of Species (1859) Darwin stated "Community of embryonic structure reveals community of descent", and in a 1860 letter to Asa Gray stated that "embryology is to me by far the strongest single class of facts in favour of change of forms". Despite Darwin's use of embryology to support his views, Von Baer rejected the theory of common descent and did not regard embryological similarities as evidence for evolution. 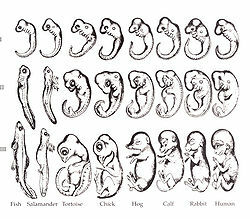 Haeckel's embryo drawings. The top row has been faked and the four right-hand columns are all from the same taxonomic subclass Eutheria (Placental mammals). From Georges Romanes's book Darwinism Illustrated (1892). The theory of recapitulation was a subsequent attempt to apply embryological similarity in support of Darwinism, which was first put forth in 1866 by Ernst Haeckel. He coined the phrase ontogeny recapitulates phylogeny to summarize the view. Haeckel suggested that gill slits and a tail could be seen during embryo development in organisms that did not possess them as adults. It was asserted that these organism must have possessed structures during their evolutionary history that were lost in adult stages due to natural selection. His theory held that during embryo development an organism progresses through stages in its evolutionary history - a theory that became known as the Biogenetic law. In 1997, the full extent of Haeckel's fraud was brought to light when Michael K. Richardson, a lecturer and embryologist at St George’s Hospital Medical School, London, published photos of actual embryos illustrating the discrepancies between Haeckel's popular diagram and genuine embryos. Richardson described the situation in an interview in Science magazine as follows: It looks like it's turning out to be one of the most famous fakes in biology. The effort involved an international team of embryologists who examined and photographed "the external form of embryos from a wide range of vertebrate species, at a stage comparable to that depicted by Haeckel" because up until that time it was apparent that "no one has cited any comparative data in support of the idea". They analyzed 39 different animals including those published by Haeckel and many that were not, such as marsupials, tree-frogs, snakes, and alligators, and they found significance differences with little conservation at the stage of development Haeckel claimed was most similar. In fact, the species in the fraudulent publication are so different that it is assumed the drawings made by Haeckel could not possibly have been done from real specimens. Similarities that exist between different organisms are cited by evolutionists as one of the most compelling lines of evidence for their theory. Homologous features are shared design concepts that are generally assumed by evolutionists to be the result of a shared ancestry and therefore offering support for the Darwinian theory of common descent.In The Origin of Species, Darwin referred to the similar bones in the same relative positions in the hand of a man and several other mammals as specifically what the theory of common descent would expect. The 2008 edition of Prentice Hall Biology by Miller and Levine illustrates that this concept is commonly held wherein it states: In their early stages of development, chickens, turtles, and rats look similar, providing evidence that they shared a common ancestry. Much like gene comparisons, the similarities that are evident during embryo development (von Baer's law) are assumed outright to be due to phylogenetic relationships and therefore homologous. Furthermore, embryo homology is considered to be such powerful evidence of common ancestry that patterns during embryogenesis are used to determine if shared morphological structures are truly homologous (due to shared ancestry) or merely analogous (due to convergent evolution). Miller and Levine define homology in such terms: structures that have different mature forms in different organisms but develop from the same embryonic tissues. The reemerging of the early 19th century "Von Baer's law" has stimulated a new biological discipline called Evolutionary Developmental Biology, which is a collaboration of Evolutionary Biology and Developmental Biology, popularly known as Evo-devo. This area of scientific inquiry draw from the beliefs of Darwinism that all organisms have descended from the same ancestor, and generally assumes that embryonic developmental mechanisms should be shared (conserved). Drawing from these assumptions, evolutionary developmental biologists compare the developmental processes of different animals and plants in an attempt to determine the ancestral relationship between organisms. Developmental biologist William Ballard a well known elder developmental biologist at Dartmouth College comments on the impact of von Baer's law on modern embryology. Differences among organisms have traditionally been assumed to become more significant as development proceeds, and therefore earlier embryonic stages should resemble one another more than latter stages. This view can be found presented in popular biology textbooks. Although these assumptions have persisted into modern times, it has been recognized by embryologists since Darwin that this doctrine of developmental biology "is not in accordance with the facts of development", according to British embryologist Adam Sedgwick (1894) who also stated: there is no stage of development in which the unaided eye would fail to distinguish between them with ease". Modern embryologists confirm this as well, and have further challenged the erroneous nature of these assumptions. Recent work has revealed that embryos are not more similar during the earlier stages of cleavage and gastrulation, but in fact, are most alike at the later stage illustrated by Haeckel and recently photographed by Richardson. In the gastrulation stage, fish show dramatic differences when compared to amphibians, and neither are similar to reptiles, birds, or mammals. Organisms begin life very dissimilar, then become somewhat alike during embryo development, then diverge again as adults. Evo-devos (evolutionary developmental biologists) refer to this pattern as the developmental hourglass. William Ballard adds that only by semantic tricks and subjective selection of evidence can we claim that “gastrulas” of shark, salmon, frog, and bird are more alike than their adults. Supposed homology in the bone structures of forelimbs in different mammals. Another significant challenge for evo-devo is the recognition that organs and structures develop from different groups of embryo cells in organisms that are believed to share a common ancestry. Fundamental structures, like the alimentary canal, kidney, or forelimb are commonly found to form from different embryological tissues. The alimentary canal (digestive tract) is formed from the roof of the embryonic gut cavity in sharks; whereas in frogs it is formed from the gut roof and floor; and in birds and reptiles it is derived from the lower layer of the embryonic disc or blastoderm. Vertebrate forelimbs, which were used as an example of homology by Darwin and can be found in hundreds of textbooks as proof for evolution, also develop from different body segments in different species. Rather than being proof of Darwinism, recent embryological studies have shown that forelimbs are not developmentally homologous. The forelimbs in the newt develop from embryo trunk segments 2 through 5; in the lizard they develop from segments 6 to 9; in humans they develop from segments 13 through 18. The development of the vertebrate kidney also conflicts with the view of homology. Evolutionist Michael Denton notes these conflicts in Evolution: A Theory in Crisis. Studies of the genes governing development have added even further difficulties for evo-devo. According to the views of neodarwinists, homologous features are produced by genes that have been passed down by common ancestors. Because similar genes are unlikely to have originated independently through random mutation, sequence similarity between organisms indicates they share an ancestral relationship (they are homologous). Features produced by similar sequences are then also inferred to be phylogenetically homologous. For decades it has been recognized that homologous organs were frequently produced by different genes, but more recently, evo-devo biologists discovered that certain developmental genes were highly conserved (similar) in radically different organisms. These homeotic genes are short sequences that act as regulatory switches affecting the development of structures such as eyes and legs. When mutated, homeotic genes can transform one body part into another, such as an antenna into a leg. In organisms as vastly different as mammals and fruit flies, these genes are so similar that the mouse gene can regulate the development of the compound eye of the fruit fly. In such examples, the conflict with Darwinian assumptions lies in the fact that non-homologous structures are produced (or at least regulated) by supposedly homologous genes. As Jonathan Wells states very poignantly: homology, whether defined morphologically or phylogenetically, cannot be attributed to similar developmental pathways any more than it can be attributed to similar genes. The famous embryologist Sir Gavin de Beer challenged his colleagues with the following question which remains unanswered to this day. While Darwin was convinced that embryological homology was the strongest single class of facts to support his views. Modern embryology has instead challenged the Darwinian theory of common descent by illustrating that seemingly homologous structures, such as the mammalian forelimb, developed along different pathways, and are therefore not homologous at all. While the Darwinists see these similarities as evidence of common descent, the creationist belief system causes us to generally conclude that shared structures, processes, or genes are merely reflections that they were designed by the same creator. Rather than being evidence of shared ancestry, homologies are examples of brilliant and well functioning designs that have been applied to multiple organisms, much in the same way as human designers apply concepts. ↑ 1.0 1.1 1.2 What is a Cell? by the National Center for Biotechnology Information. ↑ 2.0 2.1 2.2 2.3 2.4 2.5 Monitoring Stem Cell Research: Appendix A (Notes on Early Human Development) by The President's Council on Bioethics. ↑ Wells, Jonathan. The Politically Incorrect Guide to Darwinism and Intelligent Design, p.25-26. Regnery Publishing, Inc. 2006. ↑ Gilbert, Scott F. Developmental Biology: Evolutionary Embryology, 6th Edition. 2000. by Sinauer Associates. ↑ The Life and Letters of Charles Darwin Volume II, Page 61. ↑ 17.0 17.1 Bergman, Jerry., Does homology provide evidence of evolutionary naturalism? Journal of Creation 15(1):26–33 April 2001. ↑ Darwin, C., The Origin of Species, 6th Ed., pp. 434-435, 1872. ↑ 19.0 19.1 19.2 Miller, K., Levine, J. "Prentice Hall Biology". 2008. p385. ↑ Ballard W.W., "Problems of Gastrulation: Real and Verbal," BioScience, Vol. 26, No. 1., January 1976, pp.36-39. ↑ Denton, Michael,. Evolution: A Theory in Crisis, 1986. Adler and Adler, Bethesda, p. 146. ↑ 26.0 26.1 Wells, J., Nelson, P., Homology: A Concept in Crisis, Origins and Design 18:2, Fall 1997. ↑ Sir Gavin de Beer. "Homology, An Unsolved Problem", Oxford University Press, London, p.16, 1971. Embryology Rejects the Lie of Evolution Chapter 35 of The Miracle Of Human Creation by Harun Yahya. Homology: A Problem, not a Proof, for Evolution By Jon A. Covey. This page was last modified on 27 August 2010, at 17:27.